I am excited to share a progress photo of the built-ins installed in the family room!! My carpenter did an amazing job creating the barn doors so it was a no-brainer to hire him to build the built-ins around the fireplace. I wanted the shelves to be nice and tall so that I’d have more options with the styling and can play around with scale as I select the items to fill them in. But before the styling will come painting! I can’t wait to post the “after” photos! Christie Adams Design is a Bergen County interior designer based in Wyckoff NJ. Whether it’s a one room design or a whole house renovation, get in touch to learn more about how we can create your dream home! Can’t beat this greenery from Trader Joes for only $2.99!! Such an easy and inexpensive way to liven up a spot in your home. 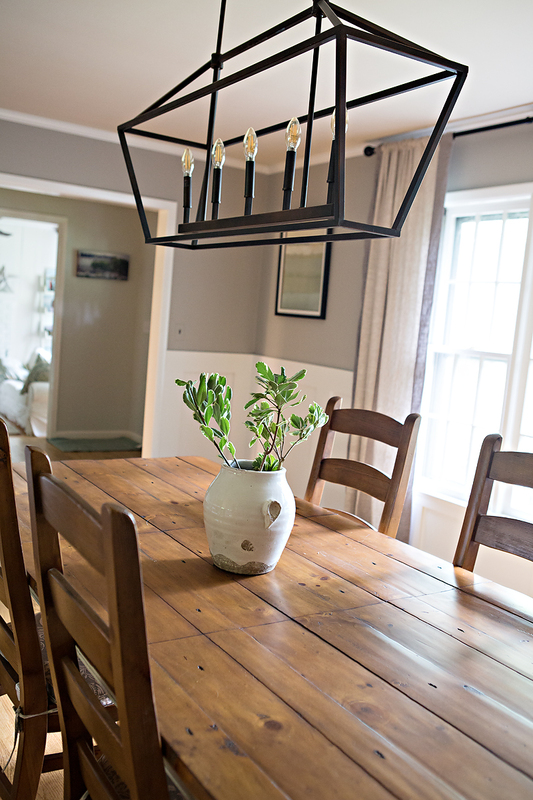 I feel like adding greenery to this vase made such a difference in making this dining room more homey and welcoming. What’s your favorite gem from Trader Joes? Christie Adams Design is a Northern NJ interior designer offering decorating and design services. The travel area is within 45 minutes from Wyckoff New Jersey in Bergen County. If you are looking for a decorator in the northern New Jersey area I would love to chat about your project! Bergen County decorator- which option would you pick? I am working on a small job for a foyer refresh with my client in Bergen County and she loved the console table that I recommended. Now we need to decide on the art above the table and the rug. I presented both of these options- which would you pick? I’m so curious to see which is the more popular choice! Christie Adams Design offers interior design and decorating services in Northern NJ. Based in Wyckoff NJ in Bergen County, Christie has a travel area of 45 minutes and is available for full service interior design projects as well as smaller jobs and consultations.